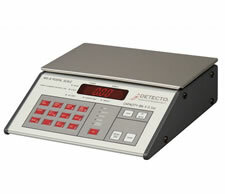 Detecto’s American-made MS-8 is a power-packed postal rate calculating, 8 lb. x 0.1 oz capacity postage scale designed for long-lasting performance and utilizes durable metal construction and a large bright-red o.6 inch (15 mm) high LED display with weight and rate status indicators. A wide range of postal rates are supported on Detecto’s MS-8 digital scale such as presort, international and express mail as well as many special services. Value added features include letter counting and a selectable default service setting for maximum operational speed. The highly visible LED display provides instant display of weight, postage rate and numeric operator input such as zip/zone, country code, etc. Sleep Mode may be enabling to automatically turn off the display after ten minutes of non-use. NTEP legal-for-trade certified.